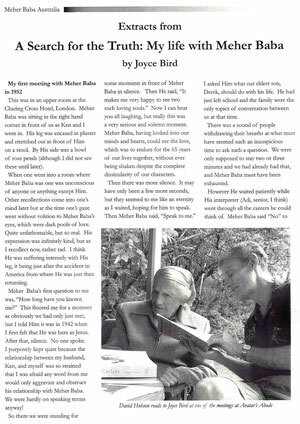 Joyce Bird - meherbabatravels jimdo page! Born : 1909- England, U.K.
Joyce was born in 1909 and passed away in 2008. Her mother was a Quaker and her father a devout Baptist, he was also a Scot and a builder. Joyce married Kenneth at 22 years old, he also was a builder. She had two younger brothers and before being sent off to boarding school, enjoyed a priviledged lifestyle. She loved musical dramas, classical music. Having left school she attended the Royal Academy for piano and singing lessons, she was a very keen gardener and an artist. Joyce had four children, two were born during the blitz of WWII and the family lived just outside London. 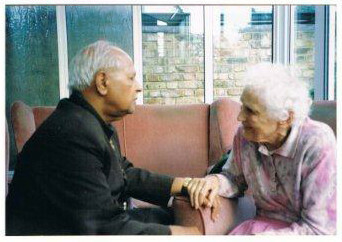 She first heard about Baba in 1942 however, it was not until 1952 that she came to meet Him in London. My parents were hardly speaking to each other due to mother's involvement with Baba and had had a blazing row en route to this visit. They went up to stand before Baba who was seated in a large chair at the end of the hall. she at once recognised Him as her beloved master Jesus. He must have recognised her too for the first question He asked her was 'how long have you known me?' then saying 'it is a long time'. Baba smiled and said 'It pleases me to see such a loving couple!" Mother also went with a group of London Baba lovers to Myrtle Beach . 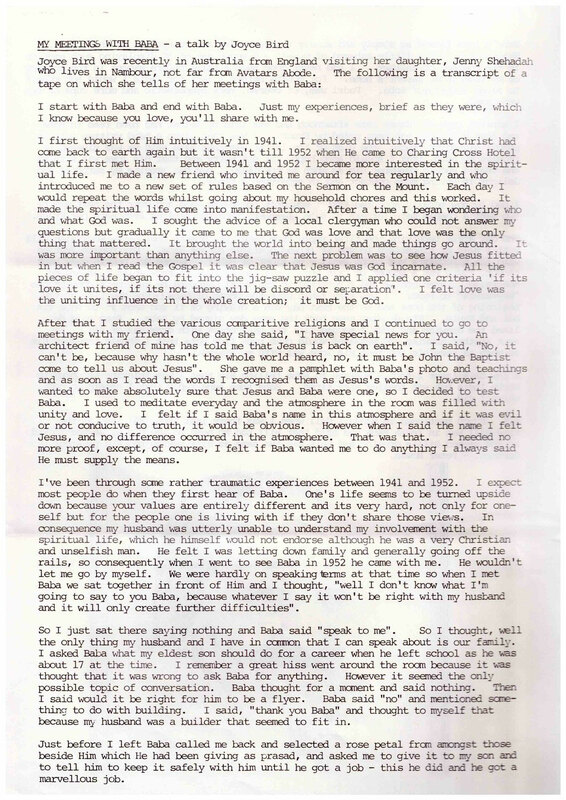 Joyce has felt very strongly for many years that she was with Him when He was Jesus. The last time Joyce was in India 19..............., Katie presented her with one of Mehera's cardigans which was highly treasured, and I recently gave it to Avatar's Abode for safe keeping along with the other Baba artifacts. 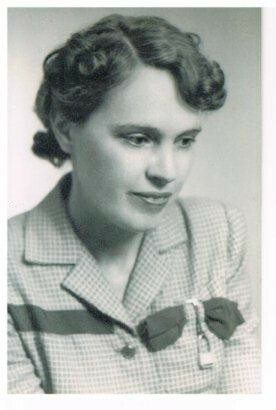 In the late 1950's Joyce was the treasurer of the London group. The highlight of the month was meeting up with her friends Delia de Leon, Fred Marks, etc., in Pete Townsends' studio on the banks of the river Thames, in his recording studio there for Baba meetings. Following her husband's passing, Joyce came to live with Barry and I on our property in Maleny,Queensland in 1998. We had just set up Maleny Country Cottages at the time, four cottages on 60 magical acres overlooking mountains. One evening Joyce tripped on a mat whilst holding a glass and cut her one good eye. She lived with us until it was no longer possible for her to be left alone for long periods of time whilst we cleaned the cottages, did the laundry and shopped, etc., and then went to live in a hostel just outside Nambour on the Sunshine Coast. Although almost blind, she managed to write three books, two about Meher Baba. She was by now in her late 80's and early 90's. Then a third book 'Happiness in Old Age' which, of course has Baba running through it. 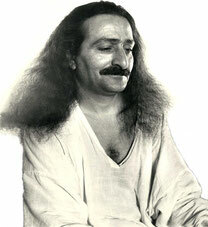 The first book was enitiled 'A Search for the truth, my life with Meher Baba', the second was 'The Search for truth in religious sayings; the last 'Happiness in old age'. 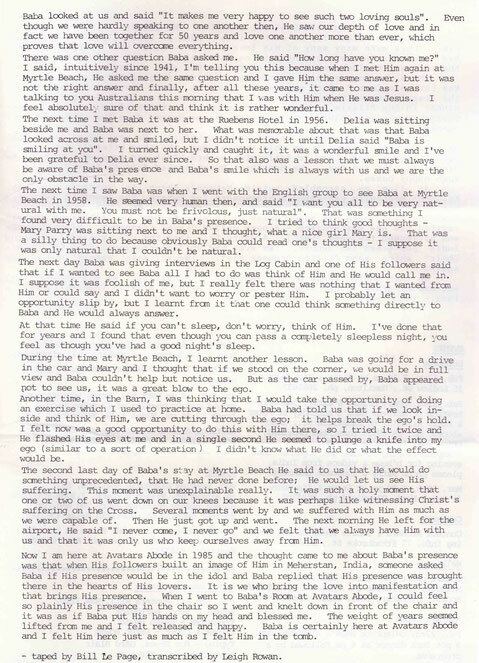 Whilst in the hostel and later in a nearby nursing home she lived for the one day in the week when Baba lovers would take her to Avatar's Abode for a meeting. 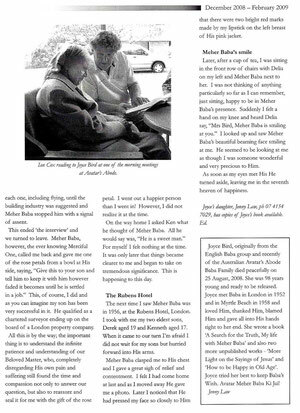 All Joyce wanted in her later years was for someone to read Baba's words to her and also to hear stories from the mandali. About 18 months before her passing, a video was made of her talking about her life with Baba in it, up at the Abode. Bill le Page would have a copy if you needed more info. He also has copies of her two earliest books. Joyce wrote her last book when she was 90 years young. One day she said to me' that every patch of light shining through the bushes in the garden is a lovely clump of flowers'. Another time she said that' if one has poor eyesight, one has to rely on unification. Our world, in fact, consists of what we make it and want it to be. The result of this is that in my own life, everyone looks young and beautiful. Even an old dustbin seen through some shrubs, I felt sure it was a clump of scarlet poppies, until I inquired of someone who could see.' Always so cheerful, so positive. All Joyce ever wanted was to be happy but Baba had given her a tyrant of a husband. Everything had to happen by the clock. Ken was very strict about this whereas Joyce was a free spirit and would come in from the garden when it was about meal time, which of course was much too late to prepare anything!. She was on such a high with Baba and glorifying nature and creation generally. Many times Joyce would say that father had been given to her to train her, probably to keep her grounded truth be known. In Australia she found warmth and happiness and at first found it very strange to be called by her christian name, surnames were used even amongst best friends in the 80's. The attached pic of her with Bhau was taken up at Avatar's Abode. Dear Bhau called her his mummy and I am sister Jen, He is so very sweet. 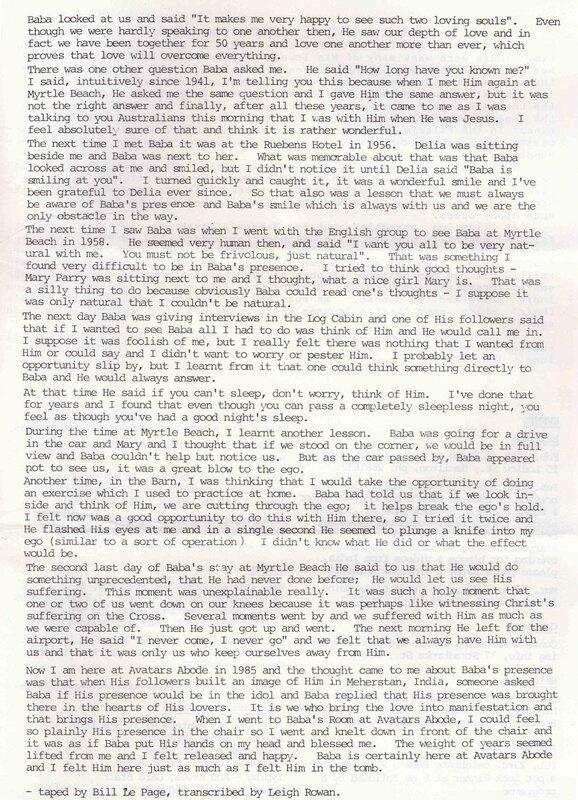 The following pages are from Meher Baba Australia newsletter issue ; December 2008 pages 4 & 5.